If you pour water all over it (assuming it’s below freezing outside) your igloo will have a coating of ice which will make it last for longer than you’d care for (I did it in Kansas, USA and it lasted well into the spring). Too late – the thaw has started! what a wonderful.. I wish it’s snowing here so I can try myself.. Sorry to nitpick, but as a Canadian, I must comment. A true igloo is built with ice blocks. What you have built is a snow hut or quinzee. Essentially, you build a mound of snow, let it harden and then carve out a space. My friends have used these structures to go winter camping. Save this article and maybe you can try it again in 30 years when it snows again in the UK! Thanks for the correction. 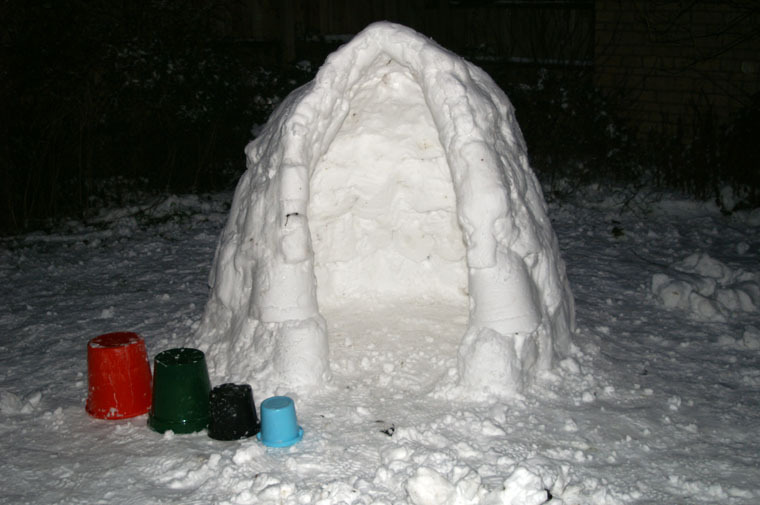 I don’t think we had enough snow in my garden (or of the correct consistency) for a snow hut. Reminds me of when I tried a real igloo last year. I live in New Jersey and have been waiting years for the right snow. We finally got about 3-5 centimeters of perfect ice-snow in New Jersey. It needed to be extracted with a saw, regardless of its small size. Picture peeling off the icing from the top of a birthday cake. About 70 blocks and 4 days later, it looked beautiful. Anyway, I’ve heard that a makeshift igloo can be made by taking snowball snow and packing it around the base in an upward slope. But KSS, we New Jersey-ians have nothing on Canada.